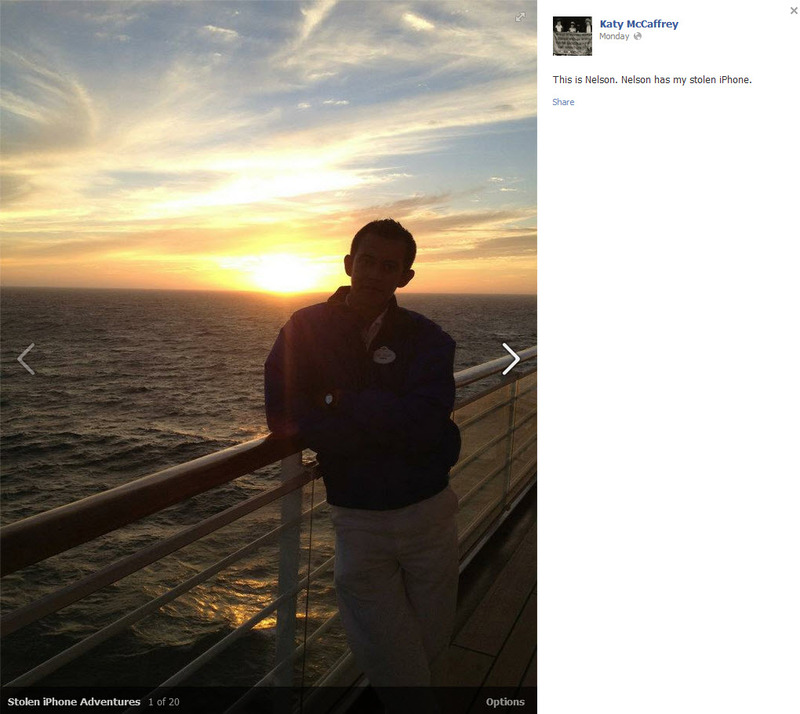 I clicked to find this album, which was created by a girl named Katy McCaffrey. I don't know Katy, but I like her style. 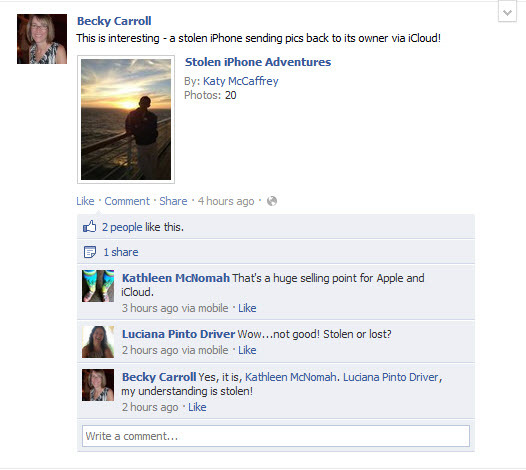 This album is called "Stolen iPhone Adventures". In the comments fields, Katy gives permission for people to share this, so I thought I'd bring it out of Facebook. 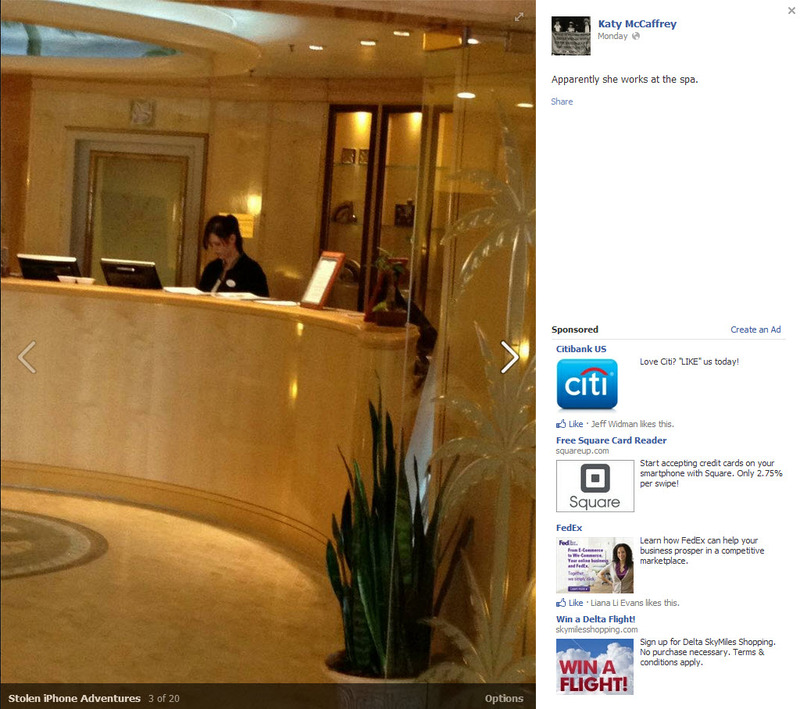 Evidently, here is his girlfriend, who works at the Spa. 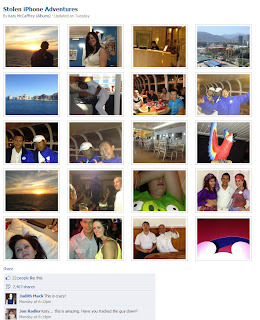 She is in many photos. 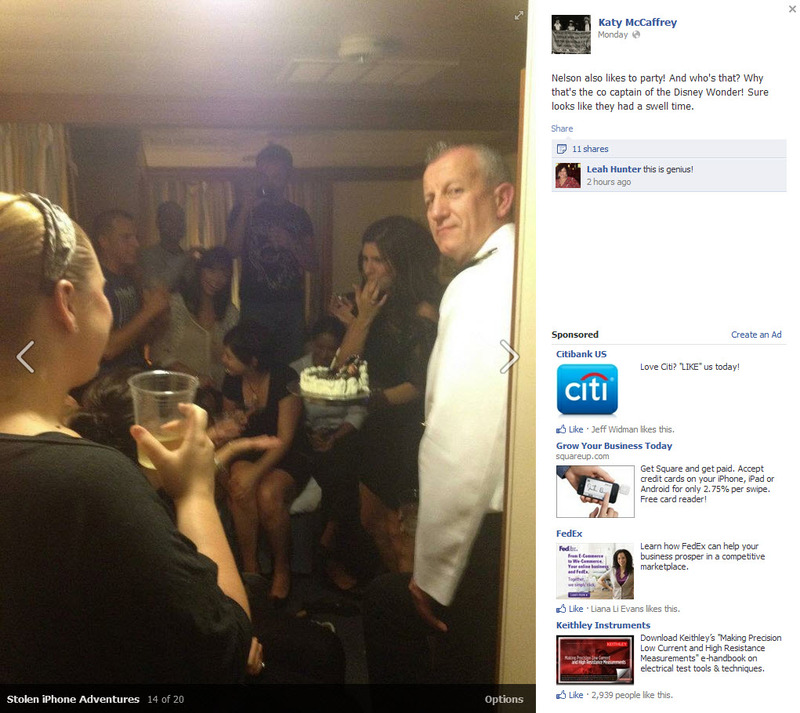 Here's a photo taken with the partying crew, including the Captain! And of Nelson, at sunset. Awww. 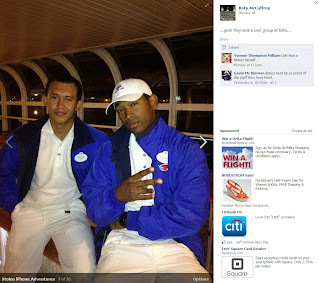 So the question is, what is Disney going to do about this pesky little issue? As of today, this album has been liked by over 7,000 users and it won't be long before major media gets a whiff. I wrote a blog post, and Katy took the following action. Good luck, Katy! This reminds me of the time my colleague lost her phone and we tracked it to the cab driver's apartment building, using the "Find my Phone" application. He returned the phone the next day - fortunately, he was an honest guy. Yet another example of how tech can tell on us. After last week’s article “Supercalifragilistic, TargetScrewed this Chat Up” I had an offline conversation about the piece with several people who were “in the know” about Target. This post references that discussion but I’m not sharing the specifics of that discussion in the interest of those involved. I do try to be fair, thorough and detailed in my writing. 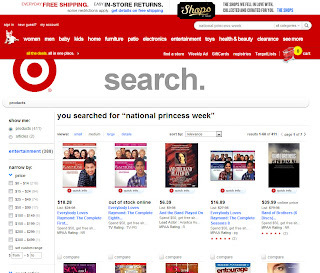 It was pointed out to me that, in my analysis, I missed a few key and what should have been obvious links to the Target.com landing page for National Princess Week. 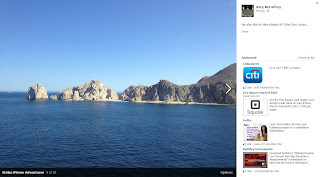 Gaining access to those links may have altered the experience I had somewhat, so I felt it was necessary to follow up quickly with a few notes about this. 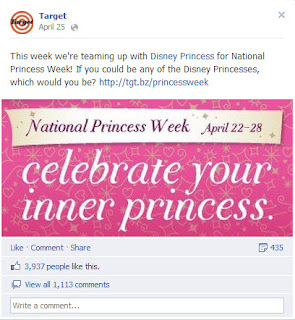 Wall Posts: I did not see an obvious link to a page or area explaining what National Princess Week was on the immediate Facebook posts from the 26th. 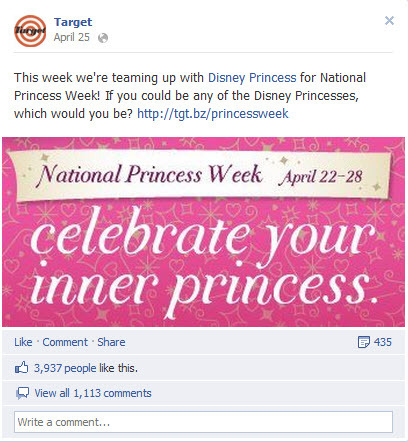 My first place to find a link to Princess Week was scanning Target’s Facebook wall and post comments. 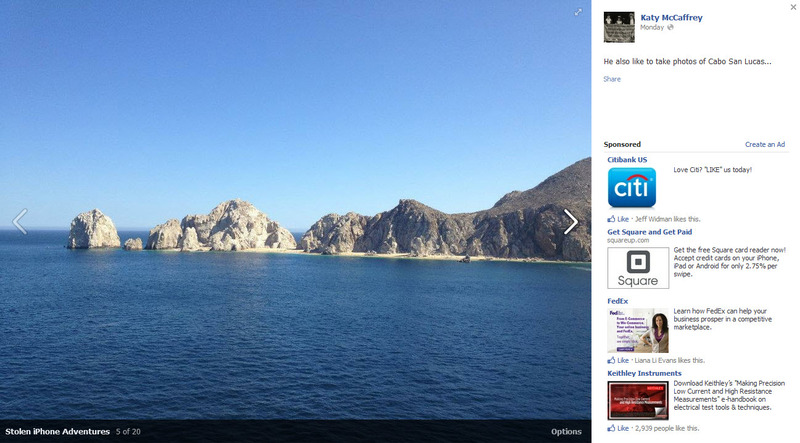 I read through two large posts with Julie’s picture with links to the chat and expanded the comment fields. 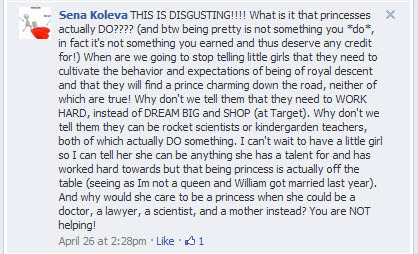 There was another post that linked to Princess Bedding, a princess survey and a princess name generator post. Sufficed to say, I didn’t look at all of the week's earlier posts, and it would have been right to do so. There were a few links to the landing page before May 26th. Simply put, I missed these because didn’t feel the need to scroll farther than I did: I was very much “in the moment” with regard to the day and the chat. Further, the Julie Andrews graphics were rather tall and took up a decent amount of vertical space – especially with comments expanded (there were hundreds). While I don't have a screen grab of the scrolling window I looked at... Further, Facebook has the annoying pattern of shifting post positions within the left and right columns. In some views it also truncates the number posts that display with a “view more” link and as content is added, it So, while I wouldn't blame any of that for my failure to dig more deeply into the week's posts....I'd assert these dynamics made it easier for me (and others) to miss things, especially left-column content due to typical eye-scanning patterns. Just an attempt to explain my own context as I did this work. I did have a screen shot of this graphic, but I inadvertently overwrote the master when I cropped it with the intention of calling out some user comments. Simply put, this link did NOT catch my eye or register - and the omission was unintentional. Not sure why I didn't notice the link --perhaps I was just distracted, maybe I didn't have enough caffeine... perhaps my brain was doing some selective filtering or I was having a bad day. Whatever the case, I should not have missed it. It was one of the most logical and obvious places for the link to be present, and it was there. So, I’d like to issue an apology to the fine folks at Target for not digging more deeply and missing these links. While I honestly don't know that seeing those links would have altered much of my feedback, this was very unfortunate oversight on my part, and resulted in an article that was less fair than it should have been. Further, as I mentioned in the article, the link to the landing page was not mentioned on the Twitter #targetchat hashtag, the posts of the day (the 26th), the online chat (before during or after) or promoted within the comments field of the day’s posts for users who had the same questions I had. 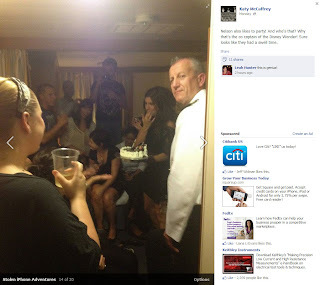 The page frames the event in a relatively clear, highly merchandised and sales-driven manner. The brief video on the landing page from Julie Andrews touches on her books and core promotional messaging, which was a true missing piece in my experience. 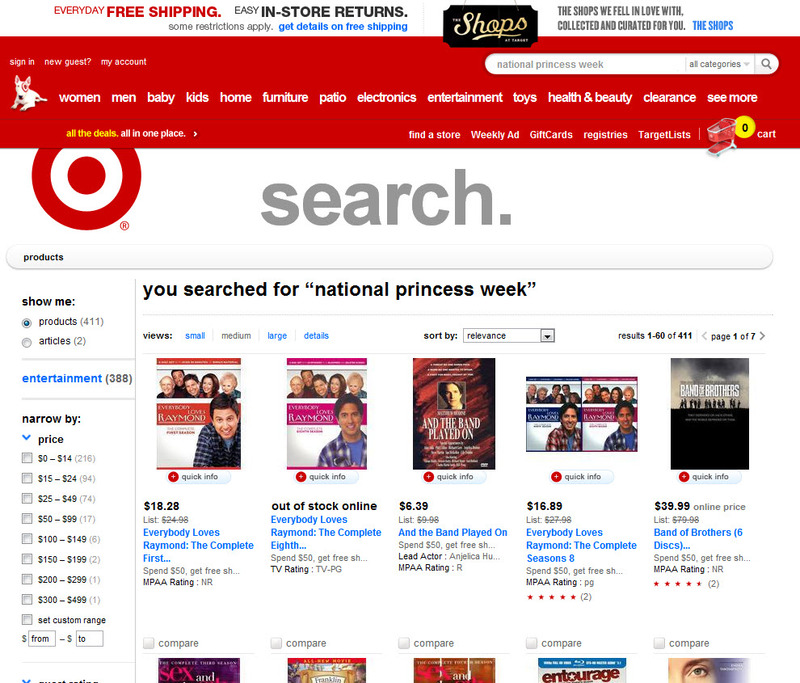 The page is not indexed in Target search which is very problematic. In short, video could have been a linchpin piece of content for Target used in other channels. It would have nicely added more mission-driven context and conversation as embedded within posts, scoring more views, greater awareness and sharing. Disabling the embed code seems like an unfortunate choice, and I'm not sure what hurdles or barriers were present -- but I'm assuming there may have been some. In closing, during the discussions I had, I was more than willing to own my mistakes. At the same time, I couldn’t help but stare at Steve Krug’s classic, sitting on my bookshelf, called “Don’t Make Me Think!”. While I stand corrected on my own errors – I agree with Krug. It’s never good to force users to go through hoops to get to your core message. I do maintain my assertion that the lack of contextual link placement on the 26th made it too easy to miss Target’s core messages – especially within context -- and I stand by the article. In short, there’s always much more going on behind the scenes than we may recognize or acknowledge. So, my feedback in no way an attempt to diminish the hard work of the fine folks at Target, or of Julie Andrews and her crew did. We are all human, and stuff happens. And much to Target’s credit, they care enough to own their mistakes too -- and to talk about them honestly and openly. Kudos and thanks. 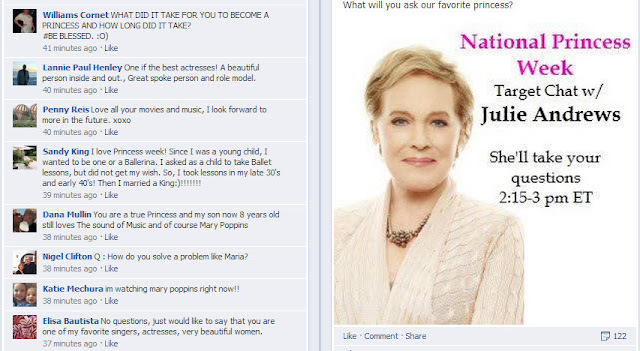 Live Chat with Julie Andrews – I LOVE HER! Starting NOW? Fun! From Mary Poppins the Sound of Music, to her appearances on the The Muppet Show, and The Carol Burnett Show and her films, including Victor/Victoria and even the Princess Diaries... I'd followed her all my life. Since I also track how businesses use social media, participating sounded like it might prove to be a nice little case study to me... so, I clicked to chat. The chat was obviously getting off to a slow start. I couldn’t see how many had joined, because they didn’t display this in the chat application. Incidentally failure to show participant numbers not only violates commonly accepted practices; it’s a poor way to show the formation of a gathering. There was also Less than one update coming per minute! GRRR.... I almost left, but I really like Julie Andrews. So I waited… A full 10 minutes and a mere nine (!!) posts later, part of me wanted to scream and the other part was rooting for the event and hoping things would pick up! I jumped in and out of the chat window (easy to do because it was so slow, I didn't miss one update). Leaving the browser window open, I sought some answers elsewhere for my outstanding questions. 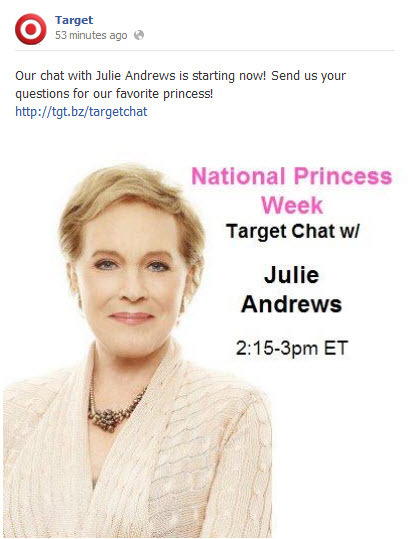 What was Julie Andrews' relationship to Target and why were they doing this chat? 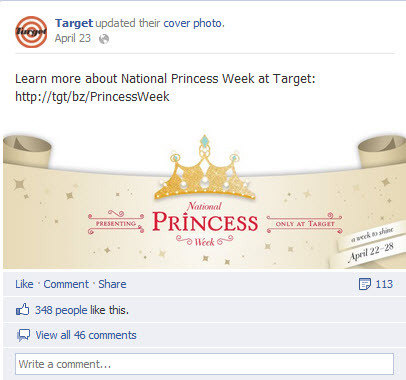 A visit to the Target Fan Page reminded me that Target is promoting the first annual National Princess Week. The image provided no answers. It only triggered more questions (Right Click to enlarge). "Okay, " I thought, "It makes sense to promote this event with the beloved, Academy Award Winning Stage and Cinema Actress, Singer ... and more recently, Queen of the Princess Diaries movies. Got it" However, I still didn't quite understand: What was National Princess Week, anyway? 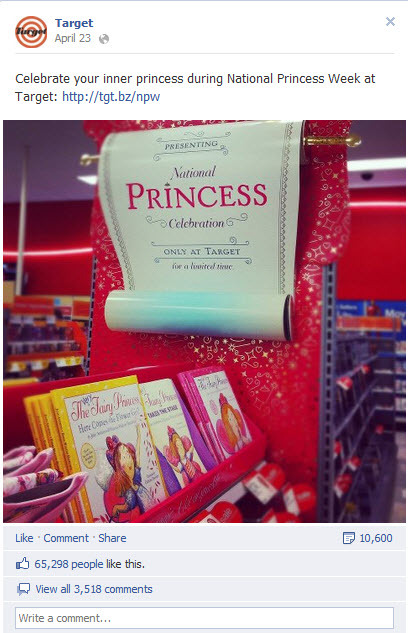 Was it something Target made up to sell princess merchandise? You'll note that I wasn't the only one who wondered about this. There was nothing on the Target.com website about it.... 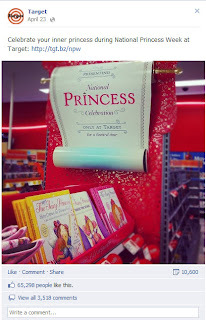 Some people also complained that there was no retail-store tie-in for National Princess Week? Eager to post a question or two, I went back into the slow grinding chat. Unfortunately, Target opted to use a third-party app that required me to log in with either my Facebook or Twitter handle. 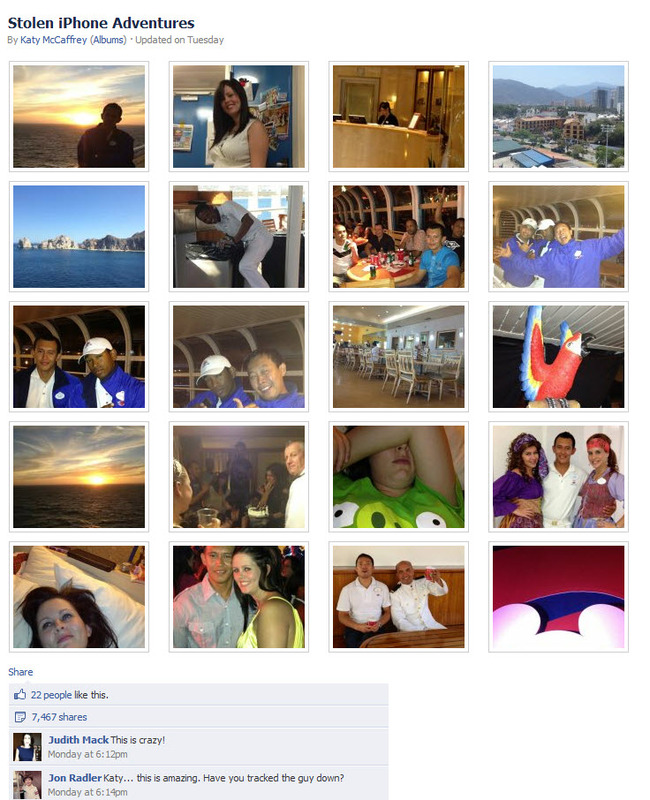 I am very conservative with apps on Facebook. I wouldn’t opt-in, because I didn't like the blanket permissions Target's suggested third-party app offered, including posting comments to Facebook on my behalf. Yeah. No thanks! NEXT, I jumped back into the chat, which continued to grind painfully ahead. I learned nothing surprising. Lots of light questions with simple answers… Her favorite things include tea, roses, poodles, crunchy peanut butter, is proud of her daughters and delighted with her grand children. She has favorite moments, ice cream, etc. She seems enchanting and writes like I would imagine she speaks. Lovely. Criminy! A 500 internal server error message. I refreshed about five times... and got the error each time. 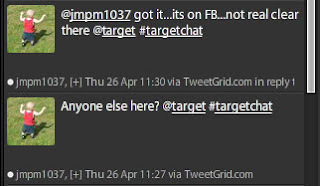 I jumped back into Tweet Deck and did an @Target #Targetchat tweet, asking them to tell Julie about the problem. Unfortunately, no one seemed to be moderating the promoted Twitter hashtag, so I have no idea if that comment was shared with Ms. Andrews' team, or not. I got the error for 5-10 minutes. I was, at this point, rather flabbergasted by the mismanagement of this event. 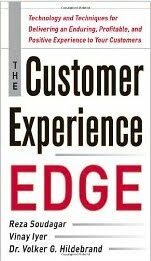 From this unfortunate problem, to the very poor event moderation, to the chat application Target had selected, to the fragmentation of the experience between Twitter and Facebook, to the arduous and slow discussion going on -- it was all just so poorly executed! The strategist in me did a forehead slap. 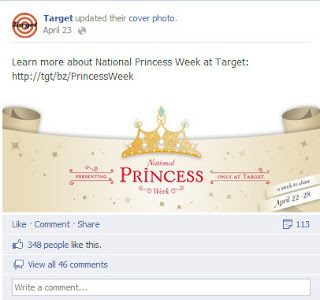 I jumped back into to the Target Facebook page, where I noticed more problems. 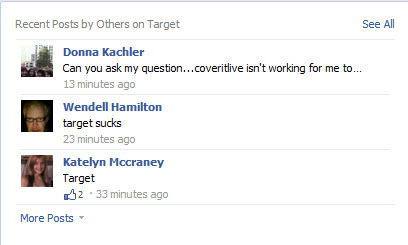 First, I noticed someone posting on Target’s wall that the chat application they used by “CoverIt Live” (by Demand Media) wasn’t working. Again, no responses from Target Community Managers (Hello? Does Target even have them?!). Next, I noticed a mounting number of COMMENTS in two of the Wall Posts about the Julie Andrews Chat. 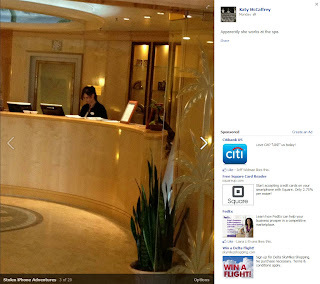 One post (an update to the one I originally saw) had 47 Comments, 1000+ likes and 67 Shares. The original one that drew me in had, at the time, 134 comments, 791 likes and 32 shares. As if Chat Application vs. Twitter Chat confusion wasn’t enough – people were trying to use the comments fields within Target's Wall Posts as a kind of Chat Window - and Target wasn't monitoring or moderating any of this feedback to redirect people to the right place, either!! Further, if you read through them yourself, you’ll see that many not only asked great questions, but others complained their questions hadn’t been answered - or were deleted! Outside of finding out that her favorite song in Mary Poppins was “Supercalifragilisticexpialidocious” (spelling), I just wasn't sure what we were accomplishing here. Jumping back into my other open tab, I refreshed the link to Julie’s website and the site opened for me. FINALLY - 30 minutes into a 45 minute chat, I began to connect some dots. While I found her site a bit difficult to navigate, getting into it made Target’s promotion with Julia make a lot more sense to me. That's when the true failure of this promotional effort became crystal clear. 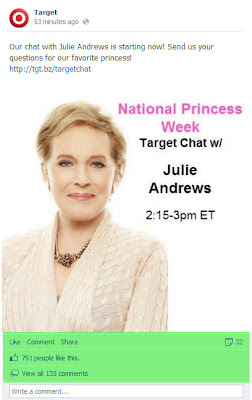 Julie Andrews actually started National Princess Day in collaboration with Disney and Target. Julie and Emma's books, poetry, songs and lullabies are also for sale in Target Stores - and they have Apps, too. This was not promoted AT ALL during the chat -- I had to do a shopping search on Target to figure this out. They certainly didn't need to make this a sales chat but highlighting this once would have been quite logical and fitting, considering the context. The website has all kinds of fun tips and ways to celebrate National Princess Week, creating memories with your kids and teaching important moral lessons. So many cute ideas... also not mentioned in the chat. Ms. Andrews and her daughter recently released their new book, "The Very Fairy Princess 3: Here comes the Flower Girl" which was mentioned by a user during the chat event -- but to which no links for browsing or purchasing were shared. Julie and Emma also have a Facebook Fan Page, which wasn't promoted or showcased during the event. Unfortunately, neither the new book OR the Facebook page were promoted during the event. 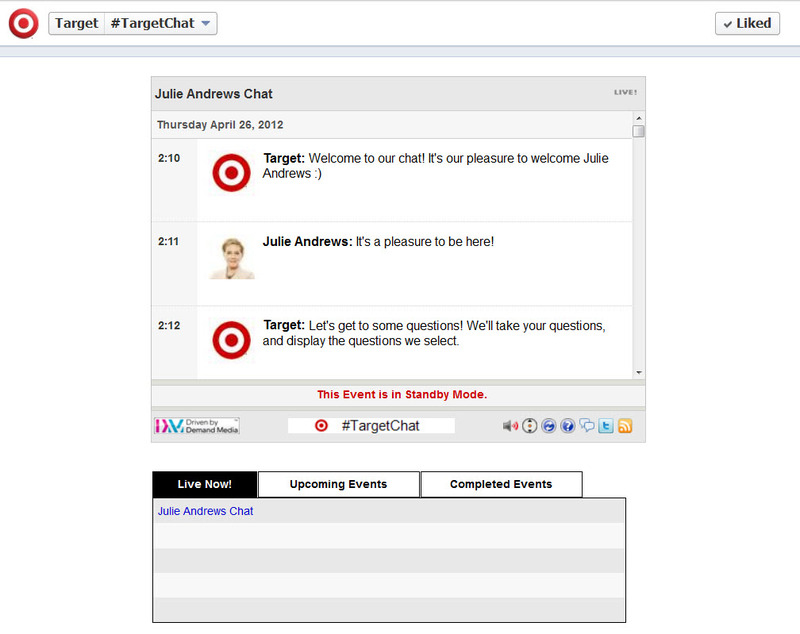 And the Facebook page itself failed to promote the chat event with Target. Perhaps worst of all, the positive mission of Julie Andrews and her daughter, Emma, was completely LOST in the confusion… The goals behind the Princess movement have to do with the creation of self-esteem and self-respect within young girls. Her site also promotes reading to kids and encouraging kids to read. These seem like such an important messages - yet they did not come out during the chat. No one stepped in to help critics like the ones below understand these simple facts. It was all terribly unfortunate, indeed. In the 50 minutes that transpired, there were less than 1.5 comments per MINUTE. 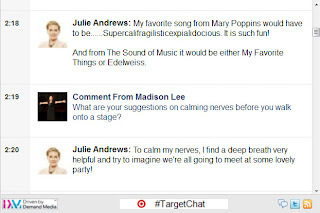 There were gaps of 2-3 minutes between posts, and outside of Julie and Target’s comments, there were only 36 unique active participants (active chatters who posted questions). I have no idea how many inactive participants, or “lurkers” there were because this view was blocked by the chat application administrator. However, in parallel to the chat, there seemed to be hundreds posting on the Facebook wall and comments fields – all quite lost and unattended by Target. This isn’t Julie Andrew's fault, at all. In fact, I’d say she was the spoonful of sugar that made it tolerable for me to hang in there for more than 2 minutes. I find her practically perfect in every way - to the point that I'm a bit intimidated to issue any criticism. less it be misconstrued by Ms. Andrews or her daughter. I don't mean to be ungracious, here. 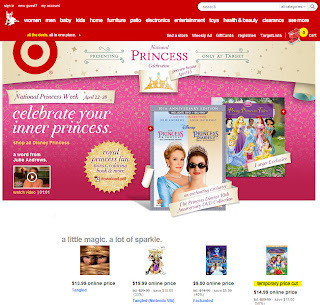 Unfortunately for Ms. Andrews, due to Target's mishandling of this situation, they were unsuccessful in effectively promoting National Princess Week, her mission to help build self-esteem in young girls and to get children to read, or to make participants aware of products and materials that could make the celebration even better. Further, the audience was unable to make those new, fresh, positive associations to Ms. Andrews, Target or Disney that should have been easy to make! A missed opportunity, really. I'm not saying this from a high horse... in this confusing era of apps and social tools -- we're all learning at some extent -- especially as these channels converge and complicate communication. However, I expect that a giant like Target would have done the basics much better. I expected they would know better, and I hope they learn from the event instead of shuffling it under a reasonably priced Princess rug. The fact that I stayed on to write a post about this on a perfectly great beach day is a testament to the weak nature of this promotion. It was such a good case study in "what not to do" for online event management, I may even write a follow-up post that highlights what can be done to make your online event a smashing success - online and offline. But not on a day off...or when I have clients to serve! ;-) Back to the real work.